During March 2011, a salvage excavation was conducted in the Bank Ha-Mizrahi compound in Lod (Permit No. A-6160; map ref. 190703/651963), prior to filling-in the area. The excavation, undertaken on behalf of the Israel Antiquities Authority and underwritten by Ofer Mahfuz, was directed by O. Segal, with the assistance of Y. Amrani (administration), A. Hajian and M. Kunin (surveying), B. Antin (drafting), A. Peretz (field photography), M. Shuiskaya (pottery drawing), P. Spivak (flint processing) and L. Zeiger (flint drawing). The excavation was conducted along the northern fringes of Tel Lod, near the Nahal Ayyalon plain, where remains dating to the Neolithic, Chalcolithic and Early Bronze Age were exposed (J. Kaplan 1977. Neolithic and Chalcolithic Remains at Lod. Eretz-Israel 13:57–75; HA-ESI 112: 63*–65*). Remains dating to the Pottery Neolithic A, Chalcolithic, Middle Bronze Age IIB, Iron Age II, Early Roman and Byzantine periods were found c. 10 m west of the excavation (Permit No. A-5658). In excavations conducted in the Newe Yaraq quarter, in the central and southern part of Tel Lod, remains of the Lodite culture (Jericho IX) dating to the Pottery Neolithic period were discovered (‘Atiqot 47:1–50), as well as remains dating to the Neolithic, Chalcolithic, Early Bronze Age IB and Middle Bronze Age IIA (Paz Y., Rosenberg D. and Nativ A. 2005. 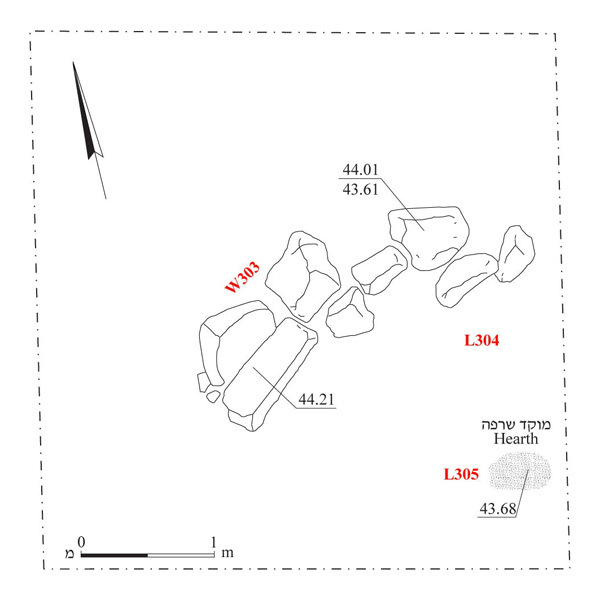 Tel Aviv University Salvage Excavation Reports 2:114–154); and to Early Bronze Age IB (HA-ESI 123). 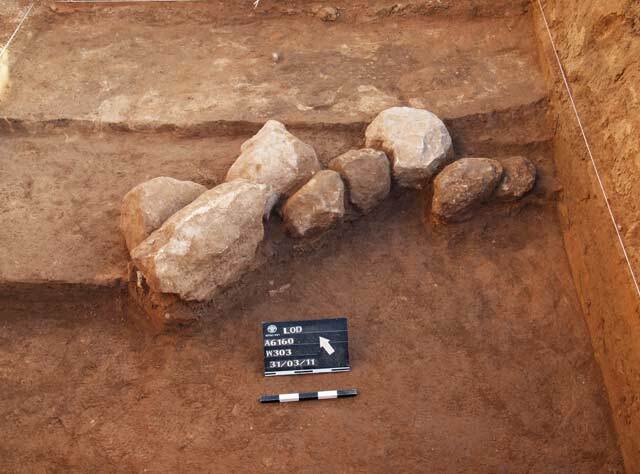 A single square was opened in the current excavation east of the bank and finds characteristic of the Lodite culture (Jericho IX) and dating to the Neolithic period were discovered. A wall (W303; length 2.1 m; Figs. 1, 2), oriented northeast-southwest, was exposed. It was built of a single course of medium (0.20×0.45×0.50 m) and large (0.22×0.40×0.85 m) limestone blocks founded atop a thin layer of sand. A hearth (L305; see Fig. 1) was revealed in the southeastern corner of the square, to the southeast of the wall. Ceramic and lithic finds dating to the Pottery Neolithic A (Lodite culture/ Jericho IX culture) were discovered in a layer of dark clay that was excavated in the square. The pottery included bowls (Fig. 3:1–8), a holemouth jar (Fig. 3:9), a jar (Fig. 3:10) and an amphoriskos (Fig. 3:11). The finds in the fill above the elevation of the wall dated to Middle Bronze Age IIB and included bowls (Fig. 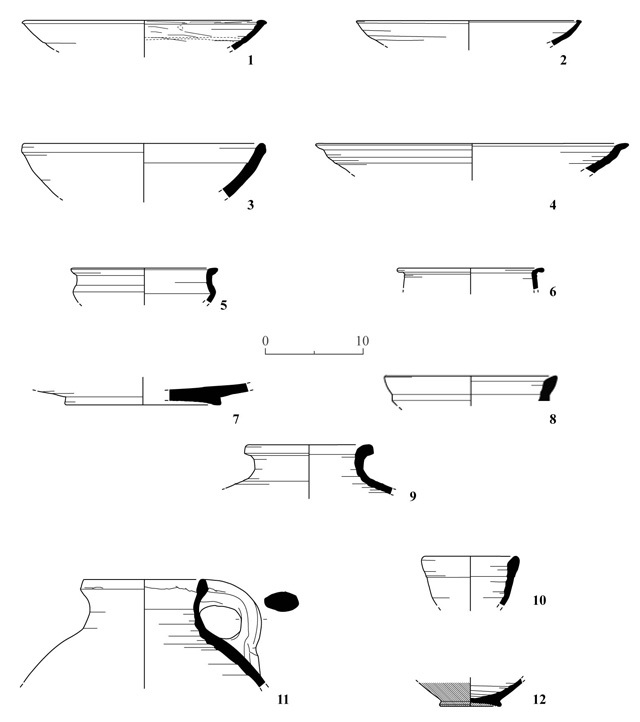 4:1–6), a concave disk base of a bowl (Fig.4:7), jars (Fig. 4:8, 9), a jug (Fig. 4:10, 11) and a base of a jug (Fig. 4:12). The lithic assemblage comprises 45 flint artifacts (Table 1). The assemblage is limited and represents a distinct flake industry, in which the ratio of flakes to blades is 5:1. One core and one tool were identified. The core has one percussion surface and it was fully depleted. It seems to have been made from a small flint pebble. The tool in the assemblage is a denticulated sickle blade with sickle gloss on its ventral side (Fig. 5). The sickle blade and core are well-known from the Lodite culture (Jericho IX) of the Pottery Neolithic period (‘Atiqot 47:29–38). 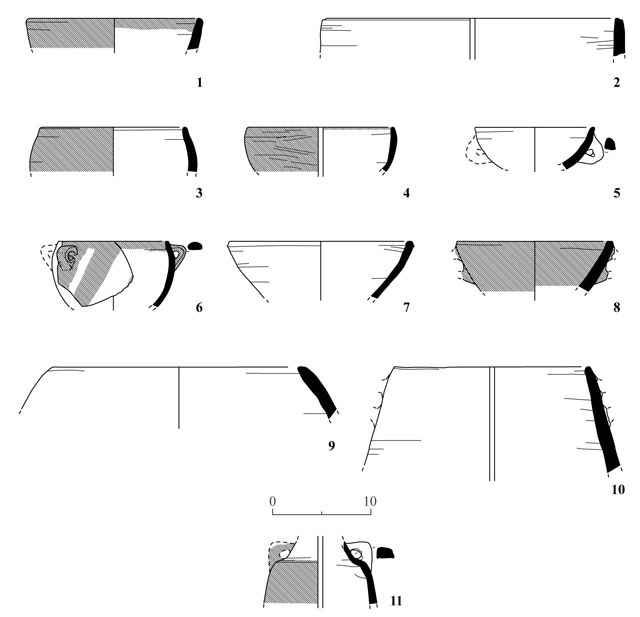 A wall and hearth that are dated to the Neolithic period (Lodite culture/Jericho IX), based on the ceramic and lithic finds, as well as comparison of the elevations of the finds from this period in the 2009 excavation (Permit No. A-5658), were discovered. The finds from the Neolithic period were exposed c. 30 m southeast of the Neolithic remains from the 2009 season and they join the artifacts of that period that were recovered from other excavations in the Newe Yaraq quarter in Lod. 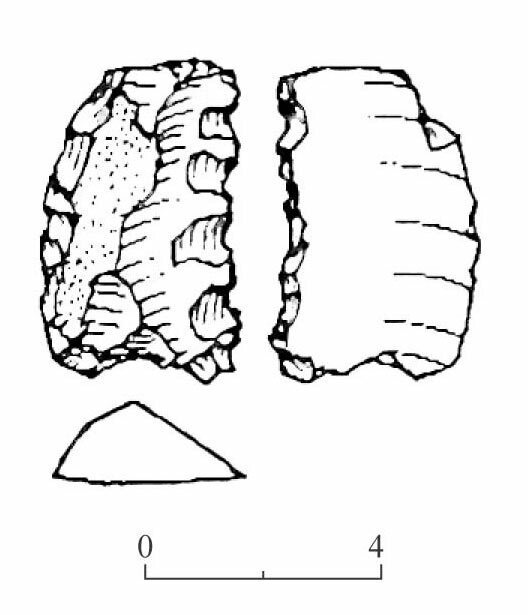 Above the Neolithic finds were layers of fill containing potsherds from Middle Bronze Age IIB and slag, which presumably originated in a stratum from this period that was obliterated following the removal of the surface level by mechanical equipment. Middle Bronze Age IIB remains were exposed west of the current excavation, c. 3 m above the Neolithic stratum, and included an enclosure wall and crucibles of a metal industry; this settlement had presumably continued east toward the excavation area, but did not survive. 2. Wall 303, looking northwest. 3. Pottery from Pottery Neolithic A (Jericho IX). 4. Pottery from Middle Bronze Age IIB.